I spent this past Saturday at the 2017 Oxford Food Forum, a conference organised by Oxford University students. It was laudable to see a dedicated crowd come to spend their Saturday talking about something apparently abstract – building connections in the food system (the conference theme was “Breaking down the Silos”). But the relatively abstract nature of the theme was precisely why I was so keen to go. Because in practice, connections are not abstract at all. As I argued in my talk, they are key to finding solutions for food system challenges. Food systems can seem complex; depictions often show a dizzying array of arrows, feedback loops, elements. It’s easy to get lost in the food system — and all too tempting to think that making connections is a nice exercise for academic boffins while important people focus on making real decisions. 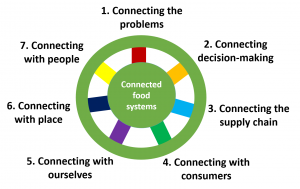 But nothing could be further from the truth: making connections is a very, very pragmatic thing to do for policy makers, practitioners and anyone who cares about the impacts of the global food system. First, making connections between the problems. This means we can find solutions with co-benefits. So often we try to solve problems in isolation. But this is missing opportunities. As was discussed at the conference, if we work to increase food sustainability in a way that also ensures people can afford healthy diets, we have bang for our buck. It was fantastic to see the inspiring Gunhild Stordalen focus on this in her TEDMED Talk out this week. Second, making connections between decision-makers. This means we will solve problems more efficiently. All problems have multiple causes. It’s only by aligning decisions made by the various government departments, international agencies and parts of businesses who influence these causes — whether they realise or not — that we will get the coherence we need. For example, as a student presentation at the conference noted, if we are concerned with increasing access to food by people in situations of deprivation, why would we clear informal food vendors from the streets? This kind of dis-connected decision making is happening all too often at the moment. Let’s remember that the Sustainable Development Goals explicitly say that policy coherence is needed to deliver our objectives in practice. Third, making connections in food supply chains. This means we are able to trace how supply chains can have more positive impact while also ensuring they function economically. This is the role of businesses and entrepreneurs, large and small. Large businesses have for years been making stronger connections in their supply chains to cut costs, using techniques like “Efficient Consumer Response” and “Vertical Integration.” Pressured by their customers, civil society, and governments, these corporations are now using the very same management techniques to enhance the traceability in their supply chains to reduce their environmental footprints, poor labour practices and food safety problems. All food businesses must relentlessly pursue these goals. But highly connected, complex chains also introduce risks: this week we heard about yet another scandal concerning contaminants entering the humus supply chain – and spreading its tentacles outwards. Connecting supply chains is also a way of concentrating power. So we also need innovators to diversify supply chains, entrepreneurs like the coffee producers in Chiapas we heard about in one talk, producers who are taking back control of their supply chains through forward integration. As was pointed out, we need innovators like this at the margins because this is where the future lies. Fourth, making connections with “consumers” – or better put, all of us who eat. This means we get the world behind us in making decisions that make a difference. The key thing here is that connections are based on trust and engagement: all too often, as we heard about from speakers on food tourism, efforts focus on “adding value” by making customers feel good about what they are buying. Imagine the wonderful forests where the coffee in your cup is coming from! Take a trip to see! Ah, how romantic. A lot of food production is far from romantic. It’s hard, and rural households are, frankly, often poor or malnourished. Let’s really connect us eaters with our food system by being honest about how supply chains work. One way to do this is, fifth, making connections with place. …the sixth: making connections between food and our own identities. The food community is full of people who feel connected to the world through food (I am one of them). This personal connection means we have a whole load of activists driving forward change; it is the source of energy that has driven the rise of local food policy councils to large international initiatives like EAT. But it is critical that we also understand how other people experience the food system. If our work connects with only people who share our personal passions, it remains a closed community, a closed system. Inadvertently, we run the risk of doing exactly what we critique the system for, which is to build a wall around ourselves, build a silo. 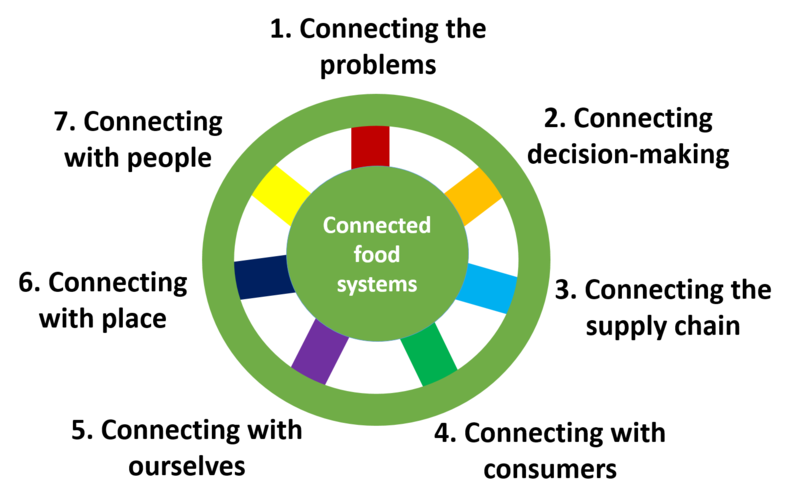 The seventh critical connection, then, is making connections with other people’s lived experience of the food system. This means we will better understand how to design solutions that work for people. Through the approach of people-centred design we need to listen and learn to identify what lies beneath people’s decisions about food — whether a person making food choices in situations of deprivation, a business leader, an informal food vendor or a government policy-maker — and take that into account in the way we design policies and programmes. This means acknowledging that above all, food systems are made of people. Let’s work harder to humanize the food system. My big learning from the conference was, though, about the connection I forgot: the social connection. Even if people don’t care so much about food, they want to connect socially and food can bring people together. It is one of the many powers of food; it is yet another connection we need to make to find the solutions for the global food system. You can view my full presentation from the Oxford Food Forum below, and as ever, keep up to date with us @CorinnaHawkes and @FoodPolicyCity. This Centre for Food Policy Dispatches blog shares what we learn from listening to the world of food policy. Immovable feasts: food for thought, activism and hope?